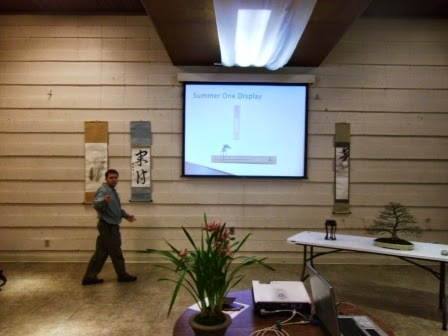 Yesterday, I had the privilege of being invited to give a lecture on the display system called Gaddou to the Bonsai Club of Utah. It was a great evening and kind of long for them. 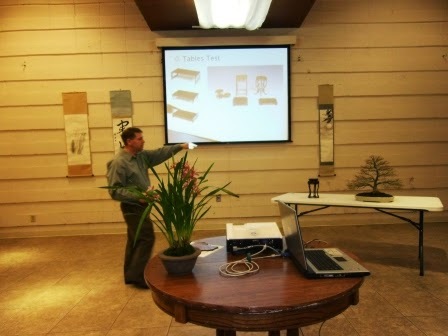 I love to be able to share the information about the display side of bonsai. I think many of the club members were excited about the opportunity to do something new. Hopefully, they are invigorated to go out and create wonderful displays with the tools and information that they learned. I was very impressed with some of the bonsai brought to the meeting. It probably would have been better to get some more hands on experience with setting up displays, but the foundation and knowledge is in place for them to make the outlines. This scroll is an order from a return customer. 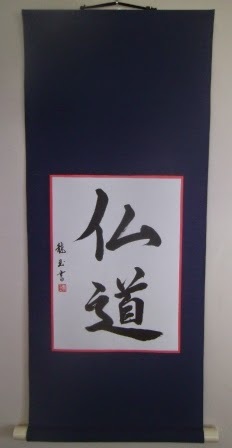 It says Butsudou in a semi-cursive style, and was written by Ryugyoku (Yoshimi Yamada Maples) I was speaking with Ken White, an adjunct professor of Asian History and Far East Religious studies at Utah Valley University and BYU about this phrase. He stated that this was a term that preceded the word 仏教 Bukkyou our Buddhism. I wanted to do this scroll in a very simple yet elegant fashion. So I did this in the Fukuro Hyougu style. It has Red Suji of 1.5 bun surrounding the entire artwork. I used a Navy cloth and Navy Hanging string. It is completed with a plastic ivory jikusaki. I think it turned out very simple, yet refined. Perhaps a reminder of the life of a Buddhist practitioner.